The first issue of H.L Gold's Galaxy Science Fiction was October 1950. 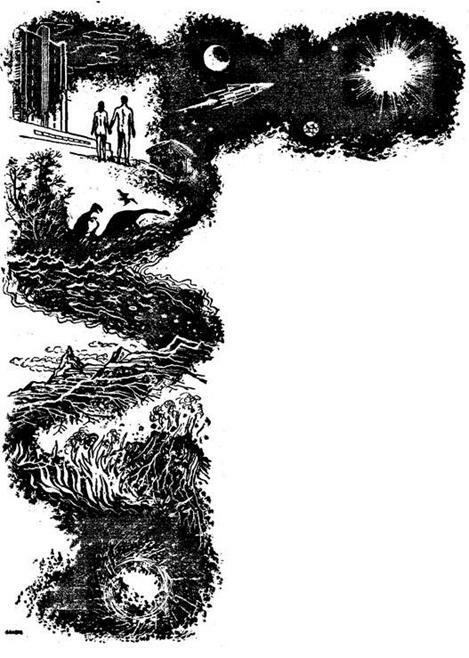 During its first year, Galaxy offered Katherine MacLean's "Pictures Don't Lie" (revamped in EC Comics as "Chewed Out" by Al Feldstein and Joe Orlando), Ray Bradbury's "The Fireman" (published later as Fahrenheit 451), Damon Knight's "To Serve Man" (later a popular Twilight Zone episode), Fritz Leiber's much-anthologized "Coming Attraction" plus a serialization of Robert A. Heinlein's The Puppet Masters (filmed in 1994). The second year Galaxy presented Frederik Pohl and Cyril Kornbluth's "Gravy Planet" (later expanded as The Space Merchants) and serialized Alfred Bester's The Demolished Man. 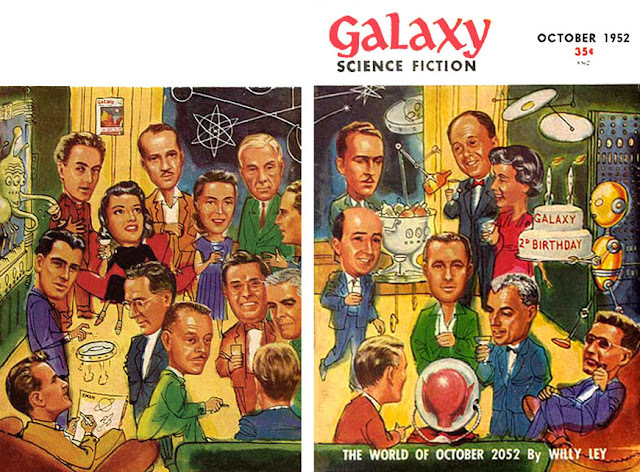 So by October 1952, there was reason to celebrate, and Galaxy invited readers to meet its writers, artists and staff in a front cover wraparound illustration by Ed Emshwiller. It was quite a party, and inside was an map to identify the sf talents. 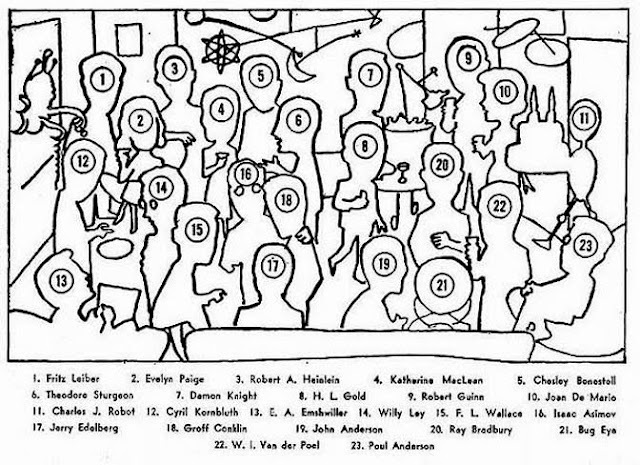 Emsh placed Gold at the center of the party, and he added several humorous touches, including a hovercraft ashtray and a miniature of the first issue's cover on the back wall. W.I. van der Poel was the art director, Robert Guinn was the publisher, Willy Ley was the science editor, anthologist Groff Conklin was the book critic, Evelyn Paige (Gold's wife) was the assistant editor, Joan De Mario was the production manager and John Anderson was the advertising manager. Jerry Edelberg was a publicist who later did public relations for the 1964 World's Fair. I've attempted a clean-up restoration from available materials. The best way to look at this is to use control-click to bring up the enlargement in a separate window that can be positioned alongside the identifications. WABC has just written a letter to the future and I helped to write it—more precisely, I talked part of it. For it was (and is) half an hour a recording tape which, when finished, was broadcast and is now safely buried in a place where it will not deteriorate, to be taken out and rebroadcast a century from now. Naturally, it is reminiscent of the Westinghouse Time Capsule which was buried on the World’s Fair Grounds a dozen years ago, to enlighten the inhabitants of this planet 5000 years from now about the doings of the year 1940. During the same year, a Time Vault was started in North Carolina, intended to preserve for posterity the books which we consider most important in our day. This idea of writing letters to the future is not exactly new. For centuries, European master builders enclosed documents, contemporary coin of the realm and an occasional chronicle in the foundation stones of buildings, and American builders took over the tradition. Trouble is that in those cases where the contents were recovered and examined, it turned out that the documents told things which we already knew from other sources, and that the coins were well known to numismatists and often not even rare, Still, one wishes that this habit had been established much earlier, say in Greek or at least Roman times. But the only Roman example of such a Time Vault was not an intentional one. About half a century ago, the learned world was startled and excited by the announcement that a rich Roman’s private library had been found in Pompeii. It had been buried when Mt. Vesuvius let go in what is probably the most publicized and romanticized volcanic outbreak of all recorded history. The rolls of parchment were charred, of course. They had dried out in the interim and were so fragile that they could not be handled in any usual way. Still, methods of transporting them, unrolling them and finally reading them were worked out. And then it turned out that the original owner of that library had been a fanatic disciple of a small and completely unimportant philosophical school. After all that labor, it was a sad disappointment. THE so-called Document Cave not far from the Dead Sea in Palestine, which was found recently, promises better results. At the very least, our knowledge of the history of the books of the Old Testament is going to be improved by that discovery; and that Document Cave might ever have been meant as a kind of Time Vault, for the documents seem to have been hidden there from contemporaries for the future, although the men who did it may have had only three or four generations in mind—not sixty or more, as it turned out to be. IN a somewhat larger sense, every book written is a small time capsule. For while a book is primarily addressed to contemporaries, it is expected or hoped to last into the future. I can get first-hand information about the knowledge and beliefs of Gaius Plinius Secundus (Pliny the Elder) directly froth the shelves of my own library. It isn’t an original, but it is serviceable. Even originals last a long time, though. If I want to find out what the famous Municipal Physician of Zurich, Dr. Konrad Gesner, thought and knew about fossils in 1560, my library will serve, too. And this book was not preserved through the centuries in some Time Vault; it survived through the interest and care of generations of people. The most interesting contents of any Time Capsule would be those portions in which its originators tell the future finders their guesses about the civilization, habits, etc., of the finders. But, again, it need not be a specific Time Capsule; it can be simply a book which has been preserved. As has been pointed out in GALAXY by L. Sprague de Camp, we are just beginning to reap that kind of harvest from early examples of science fiction: If we are somewhat flabbergasted at the lack of vision of daring of those writers, and more than a little astounded by the nonsense which we were supposed to indulge in—not that we don’t indulge in different kinds of nonsense of our own designing—it should merely prove to us that we should be more daring in some respects and more careful in others. Now let’s see if I can apply that advice myself. As I told my audience of a hundred years hence, I think—lots of printed paper to the contrary notwithstanding—that cities will not be obsolete. Nor do I think that the wheeled vehicle will be obsolete, having been replaced by the helicopter, or by some other device yet to be invented. Nor do I believe that the day of the printed word has almost reached its end. Having a little more space here in the magazine than I had time on the air, I would like to elaborate a bit on these statements. With and without reference to atomic bombs, we have been informed that “cities are abnormal.” Now, cities had originally the purpose of being trading centers. Later, they also became manufacturing centers. And you can’t say that those who settled in the cities did it because of necessity. Then, as now, the majority did it from choice. It is obviously more convenient to be in the center of things than in the outskirts. And having lived in the country, I know from personal experience that it is not convenient. If you get there during a heat wave, it may look that way, and the little walk of 5500 feet for a newspaper or some smokes or even your mail, down a winding road, may be pleasant. But try it on a cold winter day, when the road is icy and has eight inches of loose snow on top. Try to take care of unexpected guests, unless your basement is a private grocery store. Try to enjoy (or even be attentive) in a movie if you know that the last bus home comes by just five minutes after the show; especially, if you also know that just the last bus is often early because the driver wants to go home, too. In spite of what moralists and real estate agents tell us, the country home is convenient only if you also have a city home. And since people have the deplorable habit of looking after their own convenience, cities are neither abnormal nor obsolescent. ANOTHER item I brought up in my broadcast was transportation. Will people ride in from sixty miles away in their own helicopters? Well, some may, of course, but that isn’t the proper answer. The helicopter, once it gets to be easier to fly than the current production models, will have a great deal of advantages over the ground car. But it still needs parking space at the other end and the traffic problems of the modern city are not caused by the cars which, move, but by those which are parked. The solution is obviously a type of transportation which does not park, but keeps moving. Just imagine how easy it would be to get around in New York if all the transportation available were public transportation—subways, elevateds, busses and taxicabs. The remedy for the future might not be up to the engineer only, but to the lawmakers as well. This is not the place to go into the design of a city free of traffic problems. I just want to add that, while it has been proved that a large city can be supplied by air lift, it is neither a cheap nor a logical method of doing it. Finally: I do think that the people a hundred years from now will still buy newspapers and read books. I also believe that these books and papers will be printed—presumably with a more lavish use of color than nowadays —on paper. I don’t believe in the “electronic device” which replaces the newspaper, nor in the newspaper printed photographically on a piece of plastic the size of a special delivery stamp. All you have to do is insert it in the projector and the letters will appear on the ceiling of your bedroom. You can read it while having breakfast in bed. Damned inconvenient is all I have to say. I’ll go along with the tape recorder attached to the telephone which will take messages—”the deadline is really today, but since you were kept busy with two television shows and three conferences, it can be extended until Saturday”—while you are away. I go along with that because there you have an electrical device, your telephone, to begin with, and it can be adapted for playback. But the printed word is superior to any recording device or projector in several respects, each important. You can read it in any position you happen to prefer at the moment. You need no special reconverting tool. No matter how simple, small, light and fool and tinkerproof that device is postulated to be, you can forget or mislay it. And, like anything else, it can run down or go out of order. Also, you can easily add a note or a reminder to the printed word. Furthermore, you can file a piece of newspaper. Of course you can file pieces of sound tape, too, or plastic micro-slides, but then you need your reconverting device to find out what’s on it. Nor do I think that books will be printed on anything which we would not call paper, even though it may technically be something else. In quite a number of stories, the spaceship pilot looks up the characteristics of a planet in an almanac “printed on indestructible metal foil” and this practice, for all one can tell, was not restricted to the spaceman’s almanac in those stories. Let’s see now. My own Rockets, Missiles and Space Travel has very nearly reached the bulk where it becomes a little hard to handle. I just measured and weighed it. The dimensions are 8 1/2 x 6 x 1 1/2 inches and its paper is about as thin as it can be and still be decent, In any event, I don’t think that metal foil could be any thinner than that paper and still take inscriptions of some kind on both sides. Hence the dimensions would be the same as those of the paper book. But while the paper book, with binding, weighs two lbs., the metal book, if aluminum, would weigh nine pounds! I’m all in favor of a non-yellowing, non-cracking permanent paper for books. But no metal foil, please, unless you can come up with a useful lithium alloy of a specific gravity of 0.5 or less. Well, there you have a discourse on things that won’t happen. Go back to the stories now and see what might.